There is a wave of change taking over the nation when it comes to talking and acting on solar power. Cities, towns, communities and school systems around the country are viewing solar power as the choice to make to reduce their carbon footprint and help both the environment and their economy. 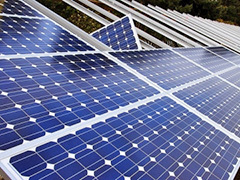 Dublin City High School, in Dublin, Georgia is not only one of the top schools in the state, but they have made a groundbreaking decision to install a solar power system that will be reducing their operating costs on a grand scale. Dublin City High School is setting an example for schools across the United States, as they all battle with smaller budgets that need to be stretched further every year. Projects such as these are blending the ideas of education and energy sustainability, which in turn supports local communities and infuses the job market. Solar power technology has progressed to the point where it is now a common choice for savings and enhancing the green effort. Dublin City High School is using their new concept of sustainable and renewable energy as an educational tool as well. Throughout the project, students will be monitoring the production as well as participating via the physics lab. In the lab, the students will have the chance to receive education on real-life energy generation, while at the same time, the business classes will be reviewing the aspects of return on investment and financial benefits. They are truly an example of fusing life, reality, education, and business with environmentally conscious actions. This school has a lot to be proud of as they establish themselves as futurists. The lessons that the students as well as the community learn and experience during this venture are destined to affect their global and environmental attitudes for the rest of their lives. Posted on June 14th under Energy of Stars. Every community battles with what they can do to help the environment and this school is showing that they aren’t just thinking about it, but they are doing something in action form. I am impressed with how well planned everything is. Not too often that you hear about something like this where they have thought everything through, from start to finish. If this works, I can imagine that Dublin City H.S. will be a trend setter and can’t wait to see if other schools will join their example. The follow up classes are perfect, so the kids can actually see a real-time situation that represents a green footprint, the benefits, the finances and the business development ideas. Congrats to Dublin High School and all of the people involved in this story. I bet the folks in their town as well as the high school itself are pretty proud. There always has to be a first in every great story and this school sounds like they are destined to make their name. Would like to follow them as they complete the installation and see how much money they can put back into the school over the long term.